ROUND 2: Slip stitch in BACK loop of first sc of round 1 (counts as first sc), sc in BACK loop of each sc around. [30 sc] DO NOT join rounds. See note 2. Repeat for second pocket. But do not fasten off after row 2. 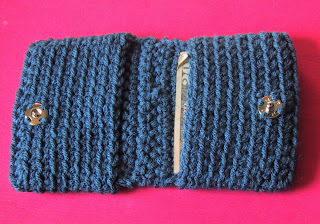 Row 3: Place pockets together with the short side of pockets on the inside. Ch 1, sc through both pocket upper edges across. 2. It seems easiest to work the case inside out when working in the back loop, turning right side out for round 9. 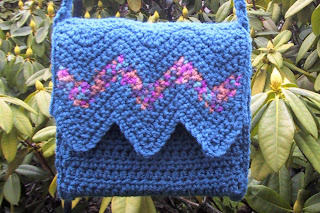 After requests for a non-felted version of my February Chevron Bag this bag was born. 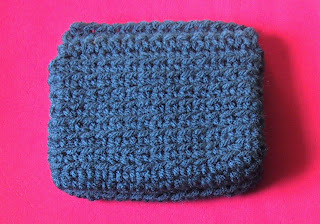 It also is crocheted, but using good ole Red Heart (or other worsted weight) yarn. I did have instructions to make this bag wider, but the wider version doesn’t hold its shape as well. If you think you must make it larger, chain 52 for your starting chain. There will be one repeat more of the pattern doing that. 1. In the photo I did rows 4-6 in the contrasting yarn. You can do as many as or as few contrast rows as you like. 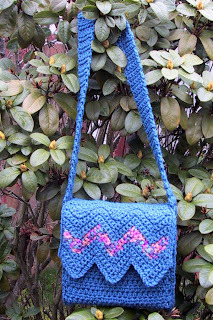 I did my second bag using the contrasting yarn on rows 4-5 and 8-9. 2. Hdc dec = yo insert hook in next st, yo and pull loop through, yo and pull through two loops. Yo insert hook in next st, yo and pull loop through, yo and pull through 4 loops on hook. 3. Dc dec = yo insert hook in next st, yo and pull loop through, yo and pull through two loops. Yo insert hook in next st, yo and pull loop through, yo and pull through 2 loops, yo and pull loop through 3 loops. 4. When crocheting the “bag” portion mark rows 23 and 26 with waste yarn on one edge. That way you won’t need to count rows when you go to attach the strap. I never remember and have to count from the beginning each time. 5. At first the “flap” won’t lay flat, but with a little coaxing it flattens out. I set a heavy book on mine over night. Row 1: Sc in the 2nd st, and in next 4 stitches, * skip 2 stitches and sc in next 5 stitches, 3 sc in next stitch, sc in next 5 stitches * repeat from once. Skip 2 sts, sc in 5 sts. Row 2-11: Ch 1, 2 sc in first st, sc in next 3 sts, *skip 2, sc in 5 sts, 3 sc in next st, sc in 5 sts repeat from * once. Skip 2 sts, sc in 3 sts, 2 sc in last st. These three rows fill in the triangles to make an even edge for attaching to bag. Row 12: Ch 1, sc in 2 sts, *hdc dec, dc dec, hdc dec, sc in 7 sts. Repeat from * once. Hdc dec, dc dec, hdc dec, ending with sc in 2 sts. Row 13: Ch 1, sc in 2 sts, *hdc dec, hdc dec, sc in 5 sts. Repeat from * once. Sc in next st, dec, hdc dec, ending with sc in 2 sts. Row 1: Ch 6, sc in 2nd ch from hook, sc in remaining chains. Ch 2, turn. Row 2: Dc in each st. Ch 2, turn. Repeat row 2 until strap is 42 inches long. Fasten off. Pin short edge of strap to rows 23-26 wrong sides together. Then pin strap to side of bag rows 6-22, pin other side to correspond. Pin opposite end of strap to other side of bag. Attach yarn on the right side of first row, at side of flap. Sc evenly along side of flap, when you get to where strap is pinned to bag, work through both layers. Work down side, across bottom and up the other side. Fasten off. Repeat on opposite side, starting at row 42, so that you are working on the right side of bag.